Ranging from more compact models to large, energy efficient fridge freezers, Siemens present a premium collection of kitchen appliances to store your food more effectively. Cutting energy costs is foremost in Siemens kitchen appliances, with refrigerators offering A+ to A+++ ratings that are simultaneously friendlier to your household bills and the environment. These models also manage to offer models as with over 300 litres of storage space, so there’s plenty of room to store food for the whole family. 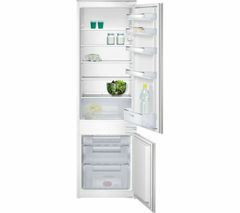 Choose the fridge to freezer ratio that suits your grocery shopping habits best. 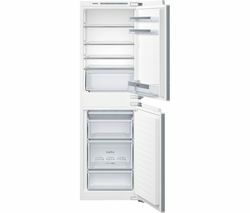 Our range includes Siemens fridge freezers that are frost free, saving you the time, mess and stress that comes with manual defrosting. Some also offer automatic fridge defrosting for added convenience. LED lighting illuminates the appliances brilliantly inside, and external LED displays help you keep track of refrigerator temperatures. There are appliances with reversible door hinges to suit different kitchen layouts too. Keep things convenient by selecting a model with storage features including egg and berry trays, ice cube trays and cold accumulators. 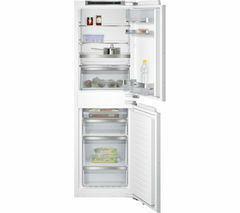 Quiet-running fridge freezers help maintain a more peaceful kitchen. 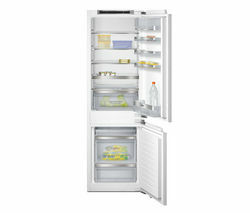 Find your ideal cold storage facility with a Siemens fridge freezer from Currys.